Ask anyone to describe a creature from the Ice Age, and many people may say a mammoth or a saber-toothed tiger – especially as they are often depicted in popular culture. But ask where they came from, and most will say they originated in the Arctic. Yet a determined group of paleontologists in China is working hard to turn that theory on its head, and through a stunning series of discoveries in China, they are rewriting the history of the fossil record and redefining where the ancestors of common mammals actually evolved. Ice Age megafauna have long been associated with global cooling during the Pleistocene, commonly known as the Ice Age, which lasted from approximately 2.6 million years BP (before present) until 11,700 years BP. The adaptations mammals made to the drop in temperatures, such as increased body size and long hair, are best exemplified by woolly mammoths and woolly rhinos. These traits were assumed by scientists to have evolved along with the ice sheet expansion. “The ancient ancestors of these Ice Age mammals, including the woolly mammoth, smilodon (saber-toothed tiger), and woolly rhinoceros were thought to have – and this is supported by Darwin’s Theory of Evolution – derived from the Arctic,” said Deng Tao, Deputy Director of the Institute of Vertebrate Paleontology and Paleoanthropology (IVPP), at the Chinese Academy of Sciences. But, said Deng, this supposition has been contradicted by a succession of findings in the past two decades. According to Deng, fossils found on the Tibetan Plateau, in particular the Zanda Basin in the foothills of the Himalayas in southwestern Tibet, suggest that some megaherbivores such as the woolly rhino (Coelodonta) first evolved in Tibet before the beginning of the Ice Age. “The cold winters in high Tibet served as a habituation zone for the megaherbivores, which became pre-adapted for the Ice Age, successfully expanding to the Eurasian mammoth steppe,” stated an article by Deng’s research team published in Science in 2011. Now, more evidence has been gathered to support this hypothesis, including fossils of the oldest known pantherine, the Panthera blytheae, fossils of the oldest fox and the origin of the Arctic fox, Vulpes qiuzhudingi, and fossils of ancestral mountain sheep, Protovis himalayensis. The woolly rhino (Coelodonta) is an extinct genus of rhinoceros that lived in Eurasia from 3.7 million years to 10,000 years BP, in the Pliocene and Pleistocene epochs. 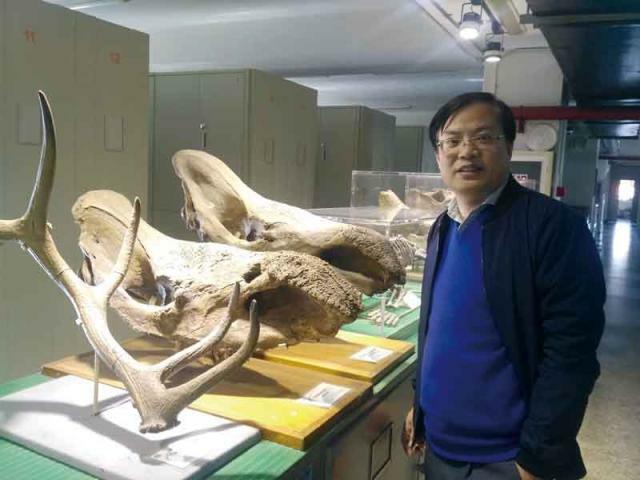 The real breakthrough came in 2000 when Deng and his team from IVPP found a complete skeleton fossil of a Nihowan woolly rhino in Linxia, Gansu Province, on the very northeastern edge of the Qinghai-Tibet Plateau. “These fossils were found in a rock stratum that was 2.5 million years old. The Pleistocene glaciation or the current ice age dated from 2.6 million years ago, so we realized these species must have come from a colder place, and considering the vicinity, we thought of the Qinghai-Tibet Plateau,” Deng explained. Due to the vastness of the plateau, which extends for 2.5 million square kilometers, the scientists needed to filter out the most likely spots for research and excavation. 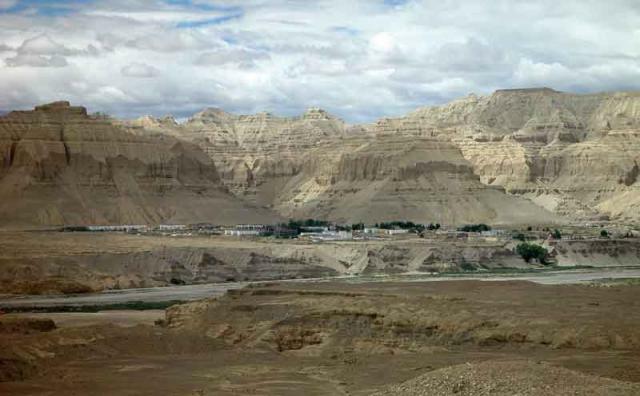 As they looked at the existing geological data to see the extent of the strata that were 6.3 million years old, the Zanda Basin in western Tibet caught their attention as a likely spot. 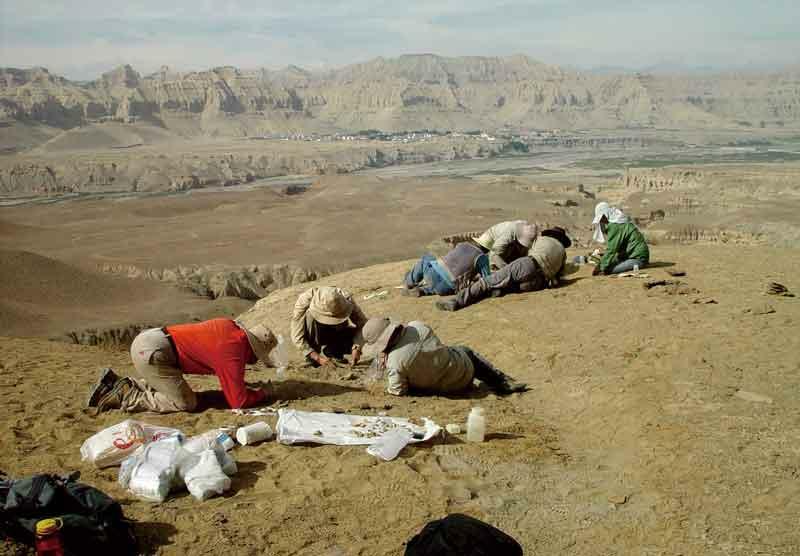 In 2006, an international team of scientists from IVPP, the Natural History Museum of Los Angeles County, the University of Helsinki and Florida State University went to Zanda on the first expedition. A year later, new fossils of woolly rhinos, including an adult skull, upper cheek and lower cheek teeth were found in Zanda. Follow-up studies proved that this new middle Pliocene (~3.7 million years ago) mammal, named the Tibetan woolly rhino (Coelodonta thibetana) from the high-altitude Zanda Basin is the earliest ancestor of the woolly rhino lineage, and the earliest representative of the genus. Following the fossil discoveries in Zanda, more evidence of other species appeared. 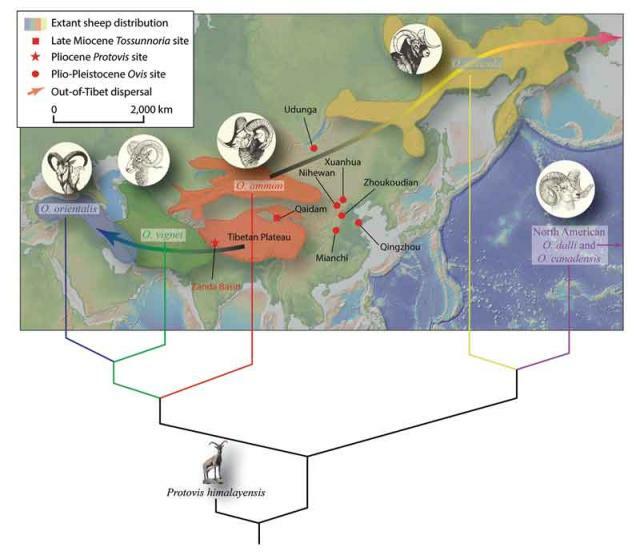 According to Deng, scientists have found a new Pliocene (5.3 million to 2.58 million BP) mammal assemblage in Zanda and in other places on the Tibetan Plateau. Also in 2006 and 2007, scientists found fossils of sheep ancestors in Zanda. “Himalayan sheep [Protovis himalayensis] are presumed to have adapted to high altitudes and cold environments on the high plateau, and began to disperse in the early Pleistocene to northern China, Siberia and West Asia. They are the common ancestors of all argali sheep, which is consistent with our previous out-of-Tibet hypothesis,” Li Qiang of the IVPP, and co-author of the article “Early Sheep from the Pliocene Tibet” published in the Journal of Vertebrate Paleontology in 2016, told the People’s Daily in August 2016. Dr. Z. Jack Tseng from the University of Southern California, also a member of the international joint research team with IVPP, found a fossil of a pantherine (a precursor to modern big cats) in 2010 in Zanda. This pantherine fossil, later named Panthera blytheae, was proved to date from the Late Miocene or Early Pliocene, living four to six million years BP. It pushed back the previous fossil record from Africa as the oldest pantherine discovered by some two million years. “As the ancestor of snow leopards, they moved out of the plateau during the Ice Age, and further expanded to Africa and the Americas,” Deng told NewsChina. Then in 2014, scientists again reported the first evolutionary link between an Early Pliocene (3.6–5 million years BP) fox, Vulpes qiuzhudingi, a new species from the Zanda Basin in the Himalayas and the Kunlun Pass Basin in the Kunlun Mountains, and the modern Arctic fox, Vulpes lagopus, from the North Pole region. Deng explained that it used to be commonly acknowledged that the Arctic fox originated in the Arctic, but this recent finding indicated they evolved on the Tibetan Plateau five million years ago. “All this continuous evidence thus reaffirmed our previous hypothesis and proved that the Tibetan Plateau served as the cradle of Ice Age megafauna in northern Eurasia,” Deng concluded. Deng said they also have preliminary findings of other species, including mammoths on the Tibetan Plateau, but more research and analysis are required before they can formally announce these new findings. These paleontological findings are key elements in disclosing the origin of many Ice Age species, while at the same time, studies of these fossils are crucial in interpreting the geodynamic evolution of the Tibetan Plateau. Fossils are remains of animals or biological organs, and the distribution of ancient wildlife is closely related to the altitude of the area. In different strata, fossils discovered can be studied closely, which will disclose the overall living environment of the animal in ancient times. 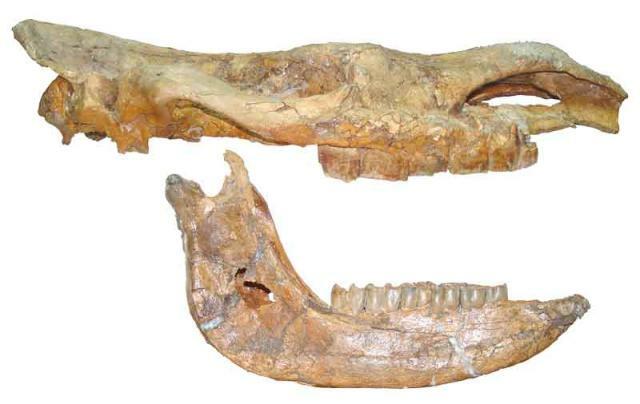 In 2012, Deng’s team reported the discovery of a well-preserved skeleton of a 4.6 million-year-old three-toed horse (Hipparion zandaense) from the Zanda Basin. Morphological features of the skeleton indicated that the horse lived in alpine steppe habitats above the tree line of the Tibetan Plateau, or an equivalent of 4,000 meters above sea level at that time, the altitude the fossil was found at. Indeed, according to Deng, China boasts huge fossil resources, while the Tibetan Plateau is fortunately one of the best-preserved areas for fossil resources due to its remoteness and sparse population. “Considering there are fewer than 100 Chinese researchers focusing on paleontology in the Tibetan Plateau, there’s a long way to go,” Deng noted.